Home » News » News » PC » SWTOR: Banned For Going to Zones Above Your Level? What’s With the Recent Bioware Hate? UPDATE: Bioware Senior Online Community manager Stephen Reid provided THIS STATEMENT on the official boards. In it, he explains the actions taken against users mentioned, and the rationale behind it. Feel like deviating for going off track from Bioware’s perfectly planned train ride? You might want to give that a second thought. According to some gripes on the SWTOR official boards, users are being banned by GMs in-game for venturing into Ilum, a region that requires users to be level 50+ to enter. 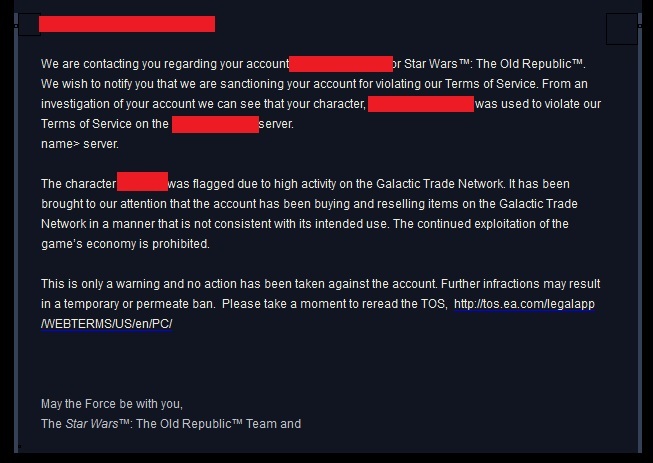 Afterwards, the user is sent an email by SWTOR support explaining the ban, and recommending the user consult the SWTOR LoS. You may not engage in any conduct or practice that results in an Account containing items, objects, currency, character attributes, rank, or status that are inappropriate for the level or rank of the character contained in the Account, i.e., “item loading,”. No clue what that means? You’re not alone. To clarify, you don’t get banned for going into the world. You get banned for looting anything in the zone. So you can go there and explore the area, taking in the local color. But if you take anything a mob drops or that is in a chest there, you get banned for “exploiting”. In this case, low level players go to a higher level world. They stealth to a place where they can “slice” things. Doing so nets higher slicing at lower levels because higher level nodes lets them ‘slice’ better. That’s what’s happening: Lower levels going to a higher level zone to use better ‘slicing’ equipment. For those of you not in the know, “slicing” is the same thing as “Decking” or “Creating a GUI Interface in Visual Basic to Track the Murderer’s IP Address”. Caught on fast, didn't it? This begs the question why not make the area Level Locked, rather than banning accounts outright? There’s a difference between using a glitch to go to unreleased zones, and using in-game transport service to fly to a planet and getting banned for looting gear to ‘slice’ there from a chest. Let’s look at the situation from the perspective of another game: EVE Online. If someone ninja-looted an officer spawn wreck (which drop the best loot in the game), all you’d get is a “Well done”. Also, basic MMO economics will get you banned in TOR. I was talking to a friend about this and come to find out his brother was permanently banned for having bought 2 items off the auction house he couldn’t use yet, they were 2 levels higher than he was. No warning just banned. Its not fake, what it is is a horrible spell check. Permanent mispelled will be caught by spellcheck and autocorrected to Permeate. Since it’s a standardized form it can happen to hundreds of people before it is caught. Thats what happens with any mass mailer. i was gonna get this but since i cannot use the games economy to my benefit I will have to play something else where I can use the in game economy. it’s been pointed out that most of the e-mails bioware has sent out have tons of spelling errors and typos in them. check the main forums. A permeate ban is a sweeping ban of all things related to the account. Basically they ban you from everything. Permeate might be a word but the usage is not correct. It’s what’s called a form letter. The first paragraph has the fancy trademarks, and the last paragraph has links to the TOS etc. They’re standardised so the GM doesn’t have to waste time writing that crap out. All the GM fills in is the middle paragraph (which is why there are typos and bad grammar in only that paragraph) with information relevant to the ban and adds character names to the first paragraph. The third paragraph is the most fake, none of it is well written, it’s trying to look like a standard email but i’m afraid it fails. The middle part is obviously written by the person sending the email, the first and third paragraphs are standard for emails, hence they contain no spelling errors. This is standard, the part that was hand written contains minor errors not worth fretting about. This does not mean the email is fake, it simply means someone in customer service did not proof read his text well enough, which outside of apparently getting some planet name wrong is fairly well written. The warning certainly looks dubious though. I doubt anyone would write all that text for a single ban, and it’s too error ridden to be copypasta. The e-mail at least is fake. Ilum is mispelled repeatedly.